Today we rejoice with our Dominican friars who are celebrating the solemn vows of their brothers, Br. Corwin Low OP and Br. Peter Hannah OP. The ceremony was held at St Dominic Church in San Francisco. Br. Peter Hannah OP gave us a lecture about Sabbath Rest in January. The information about Br. Corwin Low can be found in his blog. Their reflections and vocation stories are in here and here. We pray that they will persevere in their vocations to be holy Dominican friars. We ask you to please keep them in your prayers. April 20 is the feast of St. Agnes of Montepulciano who was a very holy Dominican Nun who was born in 1268. She was known for a very deep prayer life and many miracles even before she died. 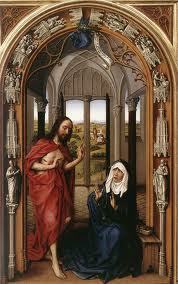 Usually she is depicted in art with a lamb because the name Agnes, comes from the Latin word for lamb. At the age of nine she persuaded her parents to let her enter a Franciscan monastery near her home. She was lived a peaceful, happy life there for some years, and then they made her the bursar (treasurer) of the monastery and then Prioress at the age of 15, and finally she was called by the Pope to found a new monastery in Proceno. Later the people of her home town of Montepulciano called on her to found a new monastery there, and she understood that our Blessed Mother wanted this one to be a Dominican monastery. 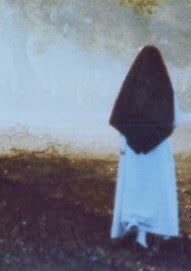 Here she lived a holy life of contemplation until her death. 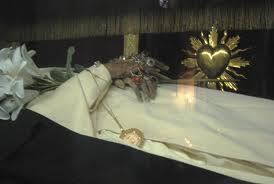 A shrine was erected in her honor in Orvieto where her body was laid out for the veneration of the Faithful. 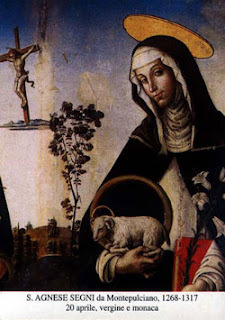 There is a legend that the great St. Catherine of Siena was devoted to St. Agnes and on one of her travels went to visit the shrine which held the body of the saint. As Catherine approached to bend over and kiss the foot of St. Agnes, we are told that the saint raised her foot so that Catherine would not have to bend so far. This may or may not have actually happened, but whether or not it did, the story does have something to teach us. It highlights the humility and charity of Agnes at the same time that it foretells the high place that Catherine will also have in heaven. And the two of them, along with any observers, must have smiled at the humorous way that these lessons were taught. One of the traditions in our monastery is the early morning procession on Easter Sunday. It is called the "Procession At Dawn", and is intended to commemorate the moment when tradition tells us that Jesus came to His most holy Mother immediately after the Resurrection. Scripture does not give us evidence of this apparition, but we all feel it in the depths of our hearts that Mary must have been the very first one to whom Jesus came after He rose from the dead. 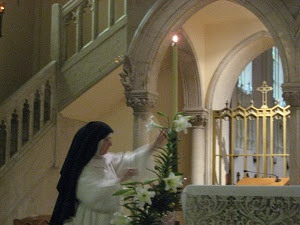 In the early hours of the Feast of the Resurrection, singing the sweet words of Easter chants, the nuns walk with lighted candles, down the two sides of the arched cloister garden, led by a Sister swinging the thurible of fragrant incense. The Prioress is on one side carrying the large processional crucifix, and a novice on the other side carrying the statue of Our Blessed Mother. The two, with the lines of nuns behind them, meet in the center and enter the door into the choir where begins the joyful Mass of the Resurrection. Mary had been faithful to her Son all her life and even when the apostles and other disciples fled in fear, she stayed with Him in loving support. Jesus, loving her with all the intensity of the Divinity, and also with the warm, tender love of a human Son, could not let her wait any longer to see Him in His glory. In her faith, Mary had believed that He would rise from the dead, but to experience it must have been the most intense joy that a human heart can experience on this earth. What joy must have passed between these two hearts after the depth of suffering that had been theirs during the past few days! May each of us and all our friends and benefactors be filled with a reflection of this joy of our Mother Mary on this feast of her Risen Son. Jesus entrusts His life to His Father, crowning a life of obedience with His sacrifice of supreme love for mankind. 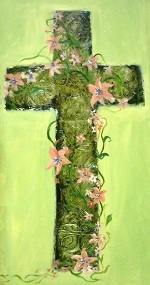 The Cross is death…it is letting go. It is surrendering everything into God’s hands…illness, failures, disappointments, contradictions, etc. God cannot be hurried. He has His own time schedule. I need only to be willing to wait. This requires silence, stillness and a willingness to be still until God moves my heart, stirs up my will and enlightens my mind. God asks blind faith and trust of me. Patience enables us to appreciate God's action - whatever is the outcome - we trust that God will bring good out of it. Fr. Frederick Faber wrote: ”It is hard at all times to persuade ourselves that there is no spiritual advantage to be compared to the giving up of our own will.” The acceptance and surrender to God’s Will is the holiest action we can take on our spiritual journey. Archbishop Fulton J. Sheen once stated: “Peace will come only when the hearts of the world have changed.” Prayer is the glue that fastens hope and peace in the midst of chaos. Criticism and negativity are ingredients in a recipe that guarantees resentment and unhappiness. Obedience sets us free to be true to ourselves and authentic witnesses of a gentle and loving God. Our world beset by violence, sexual promiscuity, the disintegration of family values, the destruction of the family unit and the evil of abortion are all signs of the downfall of every civilization in recorded history. 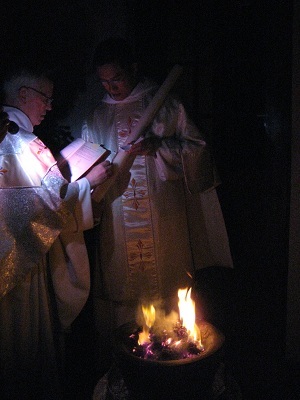 Conversion is the invitation of Jesus to imitate His self-immolation. Julian of Norwich wrote: “Mercy and forgiveness are the path that always leads us to grace.” We are challenged by Jesus, our loving and compassionate Savior, to be powerless and to experience His power in our weakness. May we pray for the grace to have ears open to obedience and a heart to do God’s will.